Mood board: Tomas Maier mused on his latest collection as ‘all about the silhouette’. Long and lean as beanpoles, his models wore snugly soft cashmere suits in brilliant black or navy with matching topcoats sensually trailing the sinuous lines of the body. 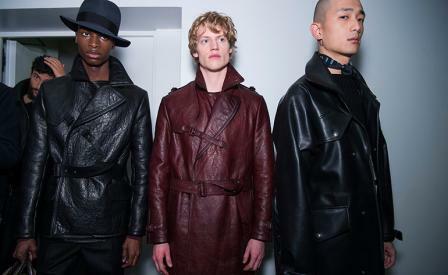 But more than shape, this collection renewed Bottega’s discourse on uber elegance: The men were proper but cool, discreet but impactful, finely dressed up and yet ready to get down. Best in show: Hefty coat jackets cut from peppery tweeds or needle punched wool checks in bright red, white and blue offered a cool take on preppy separates. Also noteworthy were Maier’s bold colour plays such as a spectacular pair of fire engine orange oversized pants paired with a deep burgundy coat whose shiny surface seemed to have been melted into crinkles. Finishing touches: Ultra Fine extras are Bottega Veneta’s forte. Maier crafted bowling shoes and square-toed leather booties that had a whiff of the 1970s, while long ropes of wool scarves and sharp fedora hats synthesised into a convincing, dandy look reminiscent of the late David Bowie.